Chinese Crested Dogs - The Chinese Crested Dog is a smaller (10-13 lbs) breed of dog known for its unusual appearance and entertaining personality. It is a member of the toy dog group. Two types of Chinese Crested Dogs can be born in the same litter; the Hairless and the Powderpuff. At first glance, the "Hairless" and "Powderpuff" varieties of Chinese Crested Dogs appear to be two different breeds, but hairlessness is a dominant trait within a single breed. The Hairless has soft, humanlike skin, as well as tufts of fur on its paws and tail and long, flowing hair on its head. The difference between a very hairy Hairless and a Powderpuff is that the Hairless has a single coat, often with hairless parts on the body, while the Powderpuff has a thick double coat. The skin of the Hairless comes in a variety of colors, ranging from a pale flesh to black, and is often mottled. The Powderpuff shares the build of the Hairless variant, but in addition has a full coat of long hair. Its fur is incredibly soft. Due to the coat type of the Chinese Crested Dog, both Powderpuff and Hairless are considered good pets for allergy sufferers. The Chinese Crested also is distinguished by its "hare foot", which has longer toes than the "cat foot" common to most other dogs. Chinese Crested Dogs are affectionate, energetic and playful. They are known to be great family pets, and good with respectful children. Chinese Crested Dogs tend to be a "one-person" dog, spotting one particular member of the family as their "owner". Often, this person is the one who gives the dog the most safe and secure feeling, and the dog would clearly show its affection towards him/her above others in the family. This information is licensed under the GNU Free Documentation License. It uses material from the Chinese Crested Dog article on Wikipedia.org. 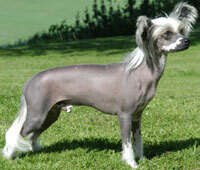 Chinese Crested Dog Breeders - Advertise your kennel puppies and dogs here.